5) Other popular responses were presenters Ant and Dec, Cheryl Cole, Britney Spears and Kate Moss. "Many people find Simon Cowell's honesty and confidence refreshing. Even though it may sometimes sound quite blunt, what he says is what he means and this is a valuable trait to have in a friend on Windows Live Messenger," said Mark West from Windows Live Messenger. How to celebrate Messenger's 10th birthday! » Download the 10 Year Party Time Pack (3 dynamic display pictures, 2 static display pictures, 6 static emoticons, 1 Wink, 1 conversation window background, 1 Messenger scene). » Download 8 Messenger Birthday Scenes. » Download the Extraordinary Expressions Pack (10 animated emoticons). » Download 6 Wacky Animal Scenes. » Download the Animal Mayhem Pack. » Download 2 Super Summer Scenes. NOTE: When installing these packs, Internet Explorer will ask you to set Bing as your standard search engine. You don't have to approve this request in order to install the theme packs. 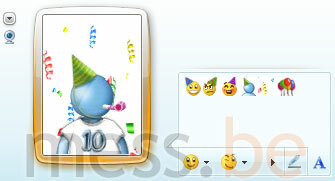 Windows Live Messenger celebrates 10th anniversary!